This year won't be quite like last year, as mentioned by Silver Spring, Singular, most know by now, there will be no organized "Zombie Walk" like previous years. However, there will be so much else going on this weekend of 10/27 & 10/28! Check out Silver Spring Zombie Walk for a detailed list of events and more info on Zombie Night. On Saturday, October 27, in addition to the Zombie Assemblage at 8pm at Sidebar and the Dance-Off in the Back Room of Jackie's (ie the sideroom of SideBar) going on from 9pm - 12pm, Piratz Tavern is having Zombie Ball as mentioned on the Zombie Walk site. Or, at 9pm you can Zombie crawl to Quarry House Tavern, for drinks and then move onward to Halloween on Screen at AFI. Also on October 27, McGinty's is having a costume party starting at 9pm. There will be prizes for best costume, creepy Halloween themed drink specials, and DJ Hawk will be throwin' down some dope boo beats. 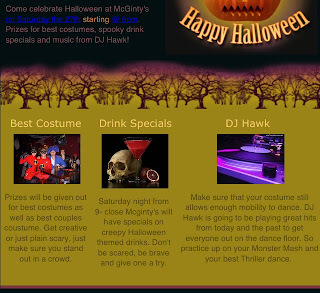 There is a $5 cover for this Halloween party. A few ideas that have crossed my path are: SunDrop girl from the commercial, a ghost (old school style), Vicki from Small Wonder - I'm wide open to suggestions on fun, creative, make at home costumes; there's still time. Creative minds, please send me your best suggestions! 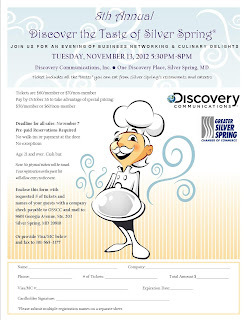 Tuesday, November 13 from 5:30pm - 8pm is the 8th Annual "Discover the Taste of Silver Spring." This event will be held at the Discovery Communications building. It's ages 21 and over (cash bar). Tickets seem a little steep, although your ticket includes all the tastes you can eat from many restaurants in the area. They are $60 for Silver Spring Chamber of Commerce members and $70 for non-members. However, if you buy your tickets before October 26, tickets are $50 for members and $60 for non-members. Note that the deadline for this event is November 7 and you must pre-register. They will not accept walk-ins at the door. 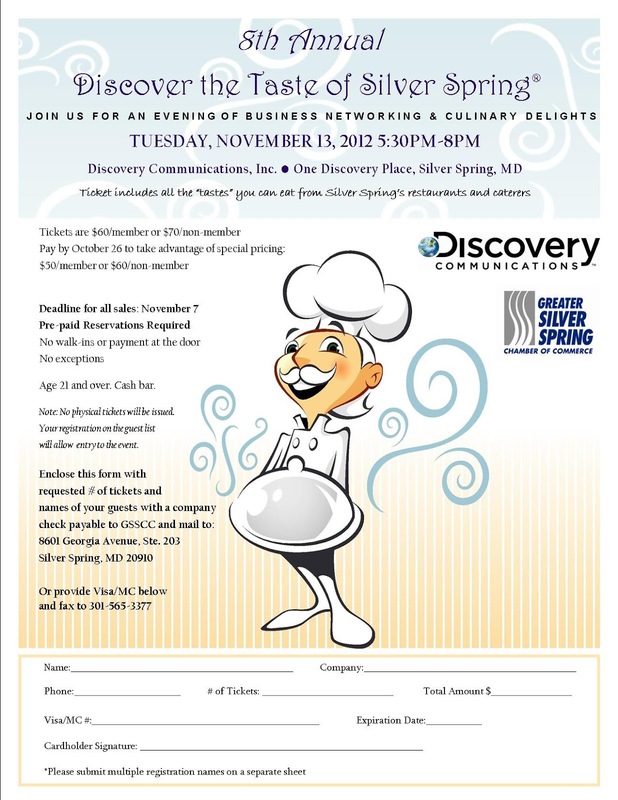 For more info, visit or contact the Silver Spring Chamber. That's it for now! Have a happy and safe Halloween! Noooooooooooooooooo, the "fail" guy has made his way to another SS blog! That said, heck no I'm not payin $60 for a tasting event. There are many dozens of great places to eat in DTSS and none of them are going to run you $60 a person before drinks. Looking forward to the Jackie's/Sidebar party! I do agree - $60 is a bit much. What I would recommend to them is to do it similar to the Taste of Arlington where it's on the street - on a few blocks, on a Saturday, and it's free to be there but $10 for 6 tickets. That gives you about 2 samplings or more depending on where you go. It would also help to know what restaurants are going to be there. A list would help so it's not like Hotwire where we don't know what we're paying for. There is a Taste of Silver Spring event that is on the streets. This is not it. If you visit the Chamber's website, this is advertised as a networking event. 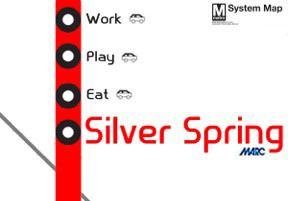 So it makes sense to have it on a weeknight, since it seems geared to the office workers in Silver Spring.